Mahapurusha Srimanta Sankardeva Viswavidyalaya Recruitment 2018 is looking for meritorious, energetic and dedicated persons to be appointed in some temporary posts of teachers (to teach at UG and PG levels) at its Nagaon and Rupnagar, Guwahati Campuses. Applications with all relevant testimonials from such intending candidates having UGC norms are invited so as to reach the undersigned on or before 11th June, 2018. Candidate will be required to pay an amount of Rs. 2,000.00 (Rupees two thousand) only by demand draft in favour of “REGISTRAR, MAHAPURUSHA SRIMANTA SANKARADEVA VISWAVIDYALAYA” payable at “State Bank of India, Nagaon Main Branch (Branch Code - 000146)” or Cash at Accounts Branch of the University as an application fees for the post. Completed application in prescribed form along with necessary enclosures must reach the address. Last date to Apply: latest by 11th JUNE, 2018. Online Application Download Link: http://www.mssv.co.in/. 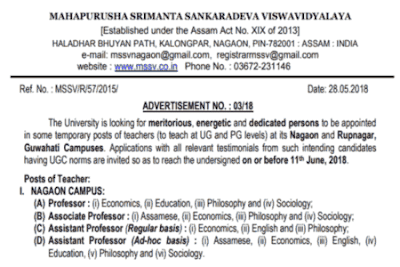 (D) Assistant Professor (Ad-hoc basis) : (i) Assamese, (ii) Economics, (iii) English, (iv) Education, (v) Philosophy and (vi) Sociology. 2. He/she must be medically fit both in mind and in body-a certificate duly signed by the District Medical Officer, Nagaon District or any competent Registered Medical Officer, approved by the Vice-Chancellor, shall have to be produced by any person who would be appointed as a Teacher, before/she is allowed to join. 3. A certificate about good character from the Head of the Institution last attended should be enclosed. 4. The candidate must possess the minimum qualifications for the post. 5. Upper age limit of the candidates, if otherwise not mentioned, shall be as per the Govt. of Assam rules / norms. a)A person appointed to the post of a teacher may have to join within 15 days from the date of issue of appointment order. b) Before a person appointed to the post of a teacher joins in his/her post, he/she shall execute an agreement with the university that he/she shall strictly abide by the provisions of the Acts and the Ordinances of the University. A Teacher shall also undertake in the agreement to submit to the Vice-Chancellor a self-appraisal report of his/her performance annually. c) The person, after joining the post of Teacher, will be subjected to the provisions of the MSSV Teachers' Service Conditions Ordinance. Mahapurusha Srimanta Sankardeva Viswavidyalaya Recruitment 2018 Advertisement Details is here - http://mssv.co.in/notices/Detailed%20Advertisement%20No.%200318.pdf.